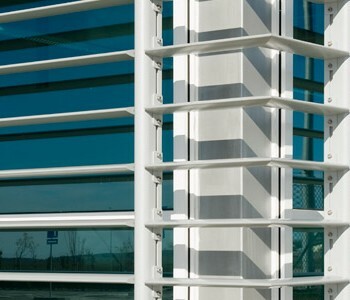 Aluminium Solutions supply aluminium brise-soleil solar shading systems designed to reduce the effects of solar glare and solar heat gain inside buildings by reflecting direct sunlight. The system, which is quick and easy to assemble, is fitted with extruded aluminium blades that provide shading whilst optimising daylight. It is externally fixed and positioned either above or around windows. It is particularly suited to south facing buildings such as offices, schools and colleges and other public and commercial buildings, where such solar control combined with the effects of natural ventilation from open windows guarantee a comfortable indoor working or living environment. The brise-soleil not only provides a practical solution to managing solar glare and solar overheating but to modern buildings, it can add an aesthetically pleasing look. Ideally brise-soleil should be positioned such that it cuts down on the amount of high angle sun during the summer months but in winter, when the angle of the sun is at it lowest, it allows the sun to pass under the system to provide some solar heating to the building. Inframe. Blades are supplied in module form and are contained horizontally within a fascia box frame. Solar reflective film applied to exiting windows.